As a business owner or marketer, you might not have the time or resources to perform the right lead generation that will convert visitors repetitively. With Facebook lead ads businesses can now ensure a seamless and effortless lead generation process for the business marketer and the customer. However, the question is, do you know how to connect and respond to your leads adequately? 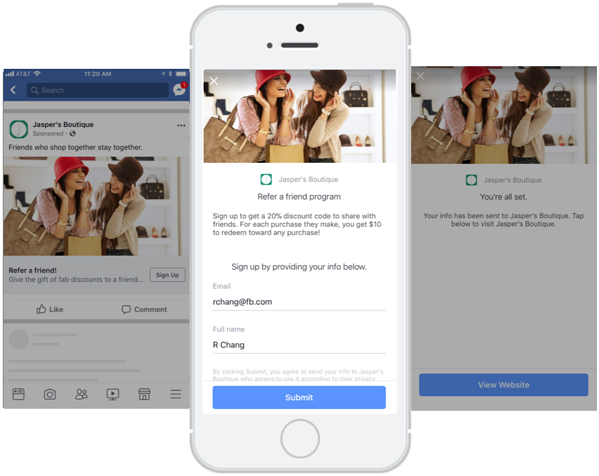 In this blog post, we are going to go over ten tips and best practices to help you give the most positive user experience and how to create the best converting Facebook lead ads. Automatic - Facebook sets/adjusts your bid to get the most results at the best price. Manual - Enter a bid based on what results are worth to you. (start with a bid that represents how much you value each lead). If you know how much each lead is worth to you, use manual bidding and set your bid to no less than your true cost-per-lead (the maximum you can pay for a lead and get a positive return on your investment). Otherwise, use automatic bidding. 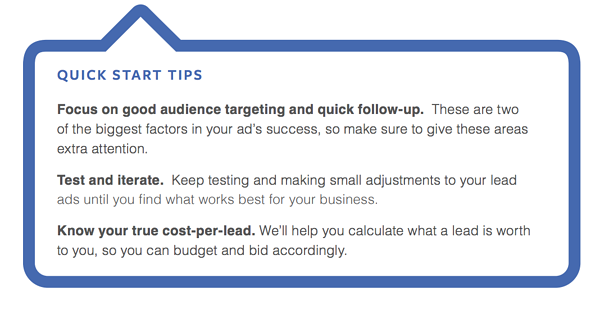 Lower bids may reduce the number of people in your target audience who see your ad set. Provide a brief introduction to explain why people should fill out your form. Facebook and Instagram’s global reach can scale your ad campaign quickly but make sure not to overwhelm your team and respond to your potential customers in a timely manner. If you find that your business can manage the volume of leads, you can increase your daily budget. Segmenting your budget too broadly might make it harder for your ads to deliver as much as you intend them to. People LOVE limited-time or exclusive offers. 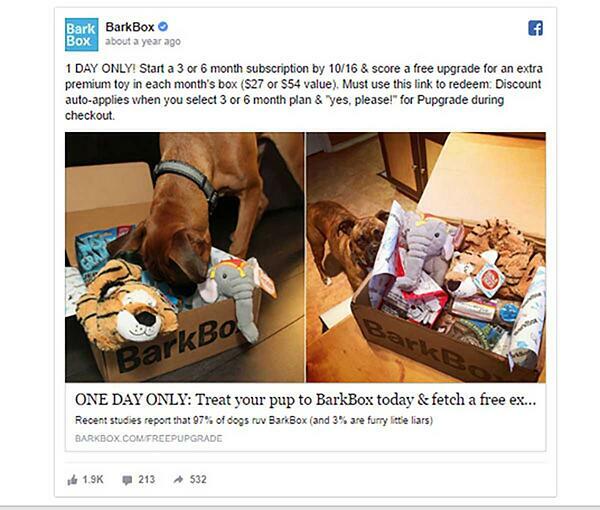 For example, Bark Box does a great job at promoting an exclusive (one day only) offer. Exclusive and limited time offers urge people to take immediate action rather than waiting! A Facebook pixel reports when someone visits your website and takes action and then reports what steps were taken. Having a Facebook pixel in place will help you see what kind of people are completing your lead form. Make sure to optimize the delivery of your ads to the people most likely to convert and give you the highest click-through rate. If you have access to your website's code, you can add the Facebook pixel yourself. 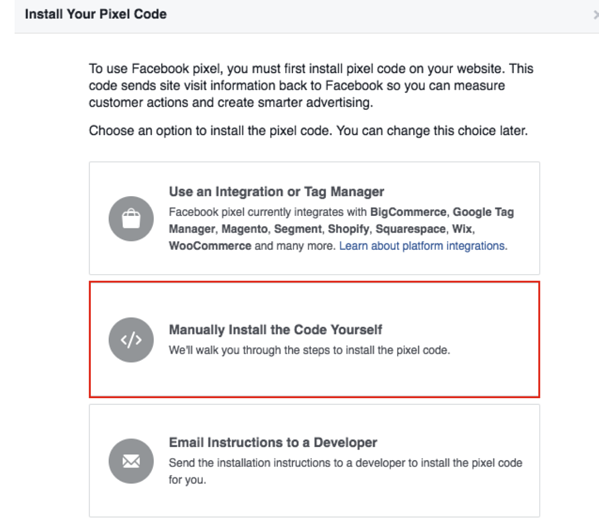 Simply place the Facebook pixel base code (what you see when you create your pixel) on all pages of your website. Make the process transparent and tell your target audience exactly what you want them to do. You can use an engaging image and utilize thumb-stopping content— like video ads, promotional ad copy, call-to-action (CTA) buttons, and a context card to let people know why they need to sign up. 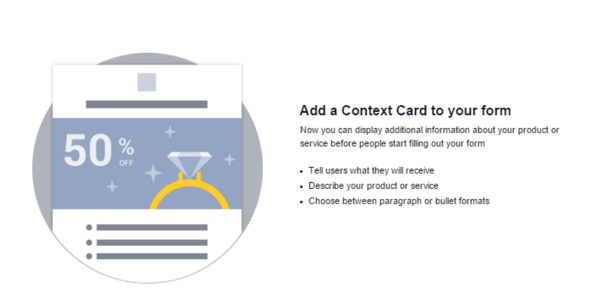 Context cards appear after someone clicks the CTA and before he or she gets to the lead form. Giving the marketer an excellent opportunity to provide detailed content explaining what/why people are signing up - helping you get more high-quality leads. Since you're asking for personal information from potential customers, make sure your brand is front and center so they feel comfortable sharing their information with you. Do everything you can to promote brand awareness. 8. Test Form Lengths & Your CTA. For the best optimization, consider an A/B test where you measure completion rates, cost per lead, and cost per conversion against the length of the form to determine the right trade-offs. Make sure to test Your CTA! A good call-to-action tells people what to do, how to do it, and what to expect. Ask yourself which audience segment has the highest potential to become customers, and create a retargeting sequence for that audience segment and try using different messages and CTAs in each ad set. Keep Forms Short - Longer forms lead to a lower conversion rate because people lose interest. You can collect more info when you follow up. Keep Open-Ended Questions To A Minimum - People don't like to type out long answers on a form. People will tune out and never complete a form when they have to answer too many open-ended questions. Limit Multiple Choice Answer Options - Minimize the amount of scrolling and limit the number of answer options to 3 or 4. 9. Use Lookalike & Custom Audiences. You can use custom audiences and lookalike audiences to reach your existing customers, website visitors, people who have previously engaged and people who are similar to your customers. Custom Audience and Lookalike Audience targeting can help you reach the most high-quality people who look like your best customers and help you find people who share similarities with your existing customers, website visitors, or people who previously engaged with your content on social media. To reach the most valuable people for your business, create lookalike audiences based on your current customers, instead of people who completed the lead form. Contact info collected through lead ads can be used to create new audiences – both custom and lookalike – allowing you to adjust your paid efforts based on where a prospect falls in your funnel or find new, similar opportunities. You can use engagement custom audiences for people who started a form but didn't submit or target people who completed a questionnaire and need nurture. The more marketers focus on re-engaging with their audience, the smoother they advance through the consumer journey. Run your ads at strategic times because timely follow-ups have proven to impact conversions significantly. Make sure to run lead ads when you can quickly respond. Use ads scheduling to schedule your lead ad campaigns to run during your business hours so people can receive follow-ups immediately after submitting their form. Also, follow up when it's most convenient for your leads. If you're unclear when the best time to respond to your potential customer is, use custom questions to find out when they would like to hear from you. Doing this will create a more positive user experience and maximize conversion rates. Remember there are so many ways you can enhance your ad performance. As you become more familiar with lead ads, you can improve performance even more by adjusting the bid, budget, audience size, targeting, creative and pixel placement. Start implementing these tips and best practices to ensure higher conversions, more sales, and better over-all lead generation. We hope our blog post will help you create more successful Facebook lead ads and if you would like to learn more about Facebook leads read our other blog: What Are Facebook Lead Ads?